More than 200 attendees gathered at the Gigabit City Summit 2015 in KC. 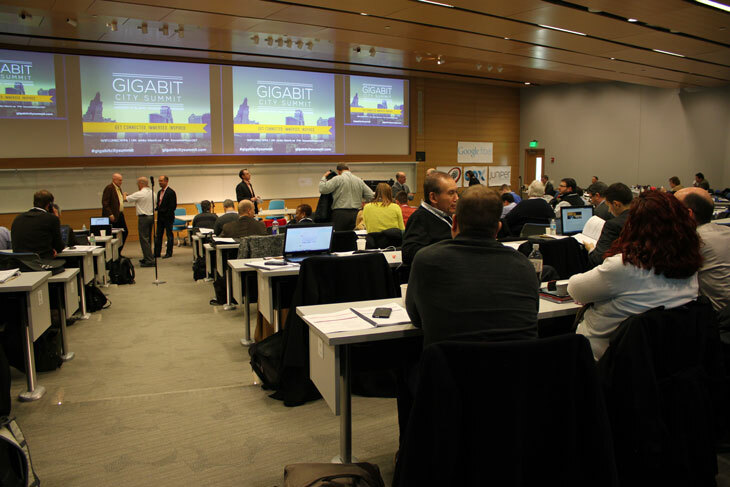 There were tons of great moments at KC Digital Drive’s inaugural Gigabit City Summit, held January 13-15, 2015, in Kansas City. The kickoff speeches by Kansas City mayors Sly James (KCMO) and Mark Holland (KCK) were superb. Blair Levin‘s opening exhortation for cities to invest in the infrastructure they want 50 years from now set a tone for enthusiasm for human-centered tech that rang throughout the conference. Boyd Cohen‘s rallying cry for cities to support creative entrepreneurs was also great, as were the many panels focusing on things like how to bridge the digital divide, how to build peer networks, how to spur next-generation innovation over gigabit technology… the list goes on. We expect even more awesomeness at our newly announced Gigabit City Summit-2016. It’s going down May 16-18 at UMKC’s stellar Bloch Executive Hall, and tickets are on sale now. People who jump on early can claim a 30% discount off both individual and 5-person Metro Delegation registrations. It’s always great when someone else sings your praises for you. Mary Beth Henry did that — literally — when she led a singalong to kick off her panel on digital inclusion, “The Digitally Underserved in a Time of Broadband Abundance.” Mary Beth, who is Portland’s Director of Community Technology, wrote her own technology-inspired take on the Rodgers and Hammerstein classic, and led the entire room of nearly 200 broadband advocates in a rousing chorus. You can catch a snippet of the merry singalong at the tail end of this broadcast from local NPR affiliate KCUR. You know how most techie conferences (and conferences in general) have exhibit halls full of sponsors standing in front of pipe-and-drape displays giving out tchotchkes? While we have nothing against that approach, at GCS, we wanted to try something different. Instead of vendors, we invited people from the local innovation/entrepreneurship community to come show off projects and businesses that are using tech for social good. We had the KC Startup Village (whose Matthew W. Marcus filmed the cool drone video above), Connecting for Good, Code for KC, the Hispanic Economic Development Corporation, the Lean Lab, Launch KC, KU Med, and about 14 others. 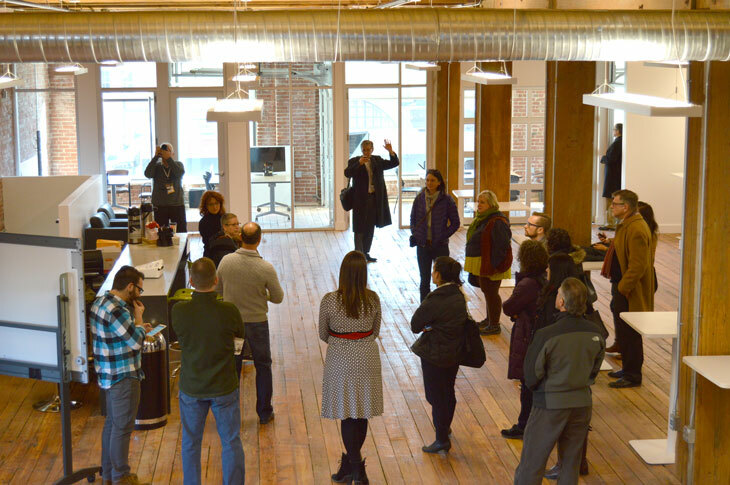 Delegates visit the new Think Big Partners space at the Gigabit City Summit. Sitting and talking about technology can only go so far. To get some hands-on experience with the work Kansas City has done to build great ventures on our fiber infrastructure, we took all attendees on a tour of 4 exciting local places: the KC Startup Village, Google Fiber Space, the Sprint Accelerator powered by Techstarts, and Think Big Partners. And we plan to do it again this year, but with more streetcar! It won’t surprise you to know that broadband conferences can be pretty esoteric. Thank goodness for Susan Crawford. Her inspiring valediction to close the conference was both of the moment and deeply forward looking. She reminded us all that broadband can be the most human of technologies because it allows us to be together. Attendees of the Gigabit City Summit watch President’s Obama broadband announcement from Cedar Falls, IA. POTUS didn’t know he was part of the agenda, but his virtual “arrival” couldn’t have been more topical. 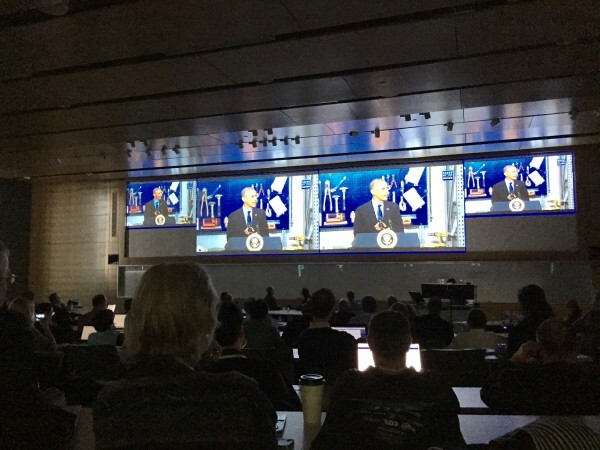 Day 2 of the Summit found us halting proceedings to watch President Obama’s live address on the need for better U.S. broadband policies from the gigabit city of Cedar Falls, Iowa. Soon after, the FCC began loosening bonds on community networks. What’s happened since then? Find out at #GCS16.